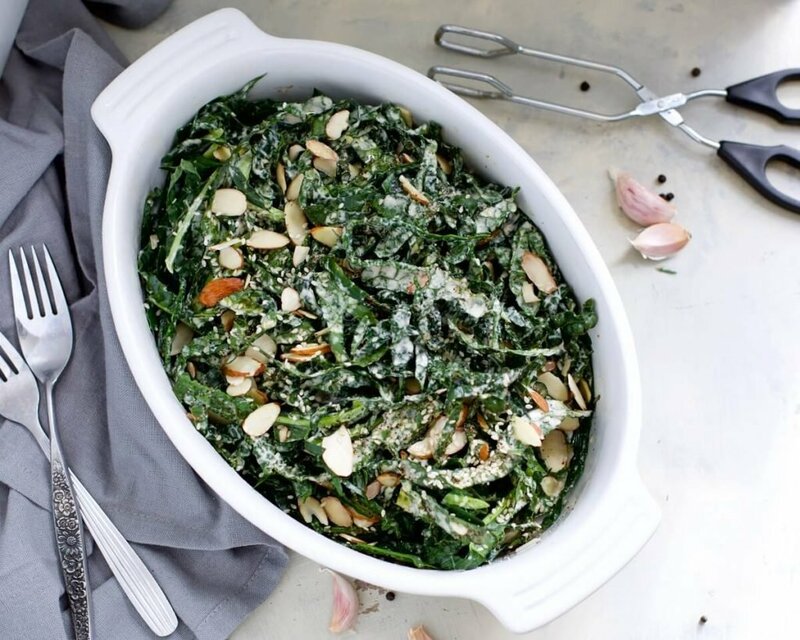 With holidays on the horizon, this Roasted Garlic Massaged Kale Salad is the perfect addition to a delicious (and hella healthy) holiday dinner! 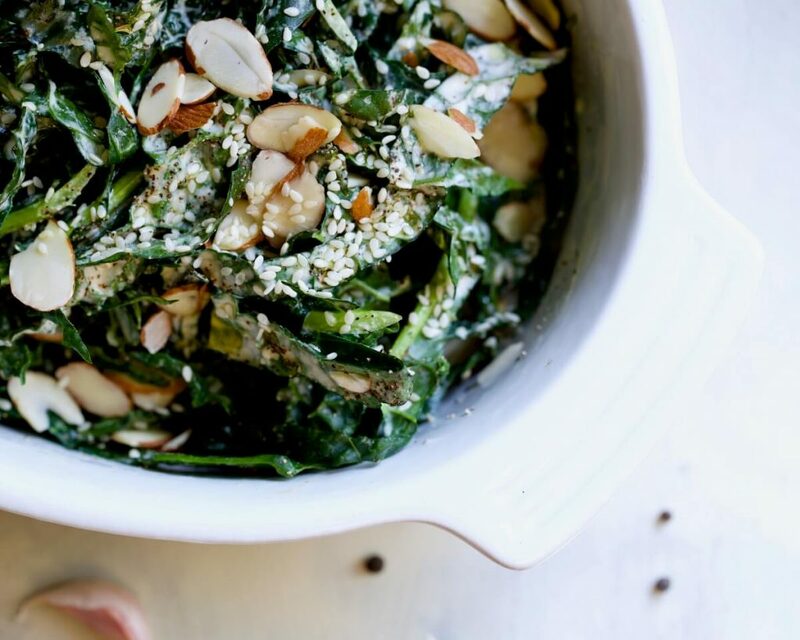 The creamy combination of tahini and apple cider vinegar in the dressing helps to cut some of the natural bitter kale flavor. We’ll also be using roasted garlic in this recipe to boost the savory factor! Raise your hand if you are equally obsessed with roasted garlic as we are?! Roasting garlic creates this unique golden, buttery texture and flavor that will have your home smelling divine. Yeah, yeah, yeah, we know. You’re probably sick of hearing about kale. But it has really earned its reputation. 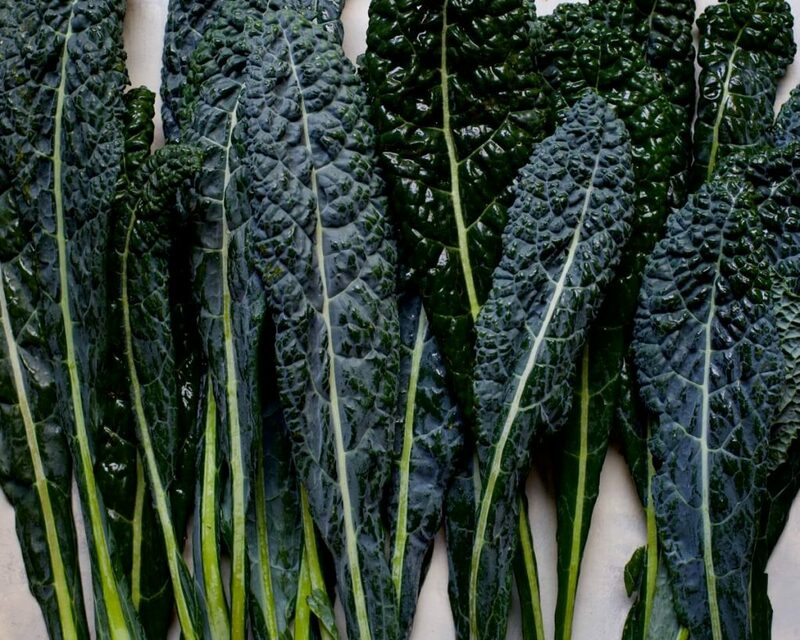 Kale falls into the category of dark green leafy vegetables. It is a powerhouse full of vitamin K, A, and C, folate, B vitamins, copper, manganese, and fiber. Just one cup of kale provides your daily value for vitamin A and vitamin C for the day. Raw kale can be a bit of a mouthful. The texture is tough and fibrous, and comes with a kick of bitterness. Massaging the dressing into the kale will soften the kale and decrease some of that bitterness. Since we already gave you a preview of what we’ll be doing, let’s go ahead and jump right into it. First we’ll roast our garlic…start by preheating the oven to 400F. Chop about 1/4″ from the top of the garlic head, exposing the cloves. Add this to a sheet of aluminum paper and drizzle 1 teaspoon of olive oil over the exposed head. Cover with the aluminum and bake for 25-30 minutes, or until the garlic is tender. Allow to cool, and remove the garlic cloves from their skins. Set aside for use in the dressing. For the tuscan kale, we cut it finely chiffonade style, which you can learn how to do here. Immerse the kale completely in a bowl of hot water. Don’t boil the water- just use the hottest water possible from the tap. Let it soak until the water has cooled, around 30-35 minutes. While that’s happening, blend all of the dressing ingredients into a thick, consistent dressing. Drain the water from the bowl the kale is in, and add the dressing onto the kale. With your hands, massage the dressing in well for 4-5 minutes (really get into it!) until all of the kale is coated. Add your toppings, and enjoy! You can leave any leftovers covered in an airtight container in the refrigerator for up to 5 days. The longer it sits, the softer the kale will get! We want to hear from you! How many of you massage the dressing into your kale salads? It’s low key therapeutic. Try it out for some self-care Sunday. Let us know what you think in the comments below! Add your toppings, and enjoy! To roast the garlic, preheat the oven to 400F. Chop about 1/4″ from the top of the garlic head, exposing the cloves. Add this to a sheet of aluminum paper and drizzle 1 teaspoon of olive oil over the exposed head. Cover with the aluminum and bake for 25-30 minutes, or until the garlic is tender. Allow to cool, & remove the garlic cloves from their skins. You can leave any leftovers covered in an airtight container in the refrigerator for up to 5 days. The longer it sits, the softer the kale will get!